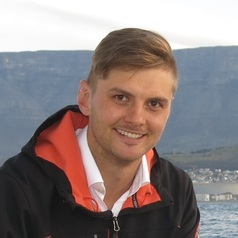 Dirk Muller holds a masters degree in mechanical engineering from Cape Peninsula University of Technology. Currently enrolled for a PhD in mechanical engineering, he has been working within the field of ocean engineering. Dirk, Professor GJ Oliver and Professor Oscar Philander have been the founders of the Ocean Industries focus area within the TIA Adaptronics AMTL Technology Station at CPUT. Muller is a researcher and mechanical engineer, responsible, among other duties, for mentoring students.